Follow the progress of this restoration by using the navigation links at the upper or lower corners of the article page. For example, to go to the next blog entry from this one, click the link “Mild Custom Build Scenario >>”. 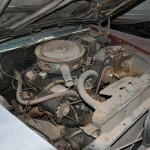 When a friend of mine contacted me offering this 1960 Buick Invicta Convertible for sale, I was interested. I’ve always liked the looks of the 1960 Buicks, and the fact that this is a convertible made it all the more desirable to me. I had seen the car before, so it was an easy decision to make the purchase. It has minimal rust for a convertible, but will still need some floor pan repair and minor quarter panel repair. Further inspection may reveal more rust, but hopefully nothing too serious. The custom two-tone paint job covers the factory original Casino Cream. 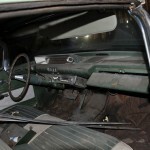 The interior is the original green and white faux “tuck and roll”. The top is a replacement for the original green, which must have been quite an attractive combination when the car was new. Having been stored since 1988 (the last time it had license tabs) means that mechanically it will need completely gone through and checked, but hopefully it won’t require anything major. Since the car appears to have been stored indoors most of this time, it will likely be a straightforward job to get it back on the road. 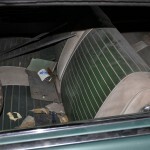 This Buick, as were all 1960 Buick Invicta’s, is equipped with the 401 c.i. V8 engine named the Wildcat 445. Better known as the nailhead, it puts out 325 horsepower and 445 lb-ft of torque. The transmission is a Twin-Turbine Drive automatic. This is basically the old Dynaflow with a new name. Factory installed options include power steering, power brakes, 2-speed wiper/washer, deluxe heater, power windows, 6-way power seat, tinted windshield and the “Safety Group” which includes backup lamps, speed-buzzer, map light and park brake lamp. It’s also equipped with the “Accessory Group” that consists of a clock (already standard on the Invicta) trunk light and license plate frame. According to Greg Cockerill of www.the1960buick.com who runs a 1960 Buick registry, this car is one of 5,236 Invicta convertibles made in 1960. In his extensive registry of over 1000 cars, it is one of only a couple that left the factory with a Casino Cream paint job and green top. This Buick, and all other 1960 Buick convertibles had their bodies made at the Fisher Body plant in Flint, MI. The bodies were then shipped to the various assembly plants to be finished. Some cars were finished in Flint, making me wonder why they didn’t streamline things a bit and just assemble ALL convertibles in Flint? 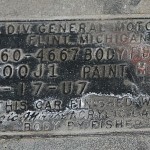 The VIN tag tells us that this car was built at the Atlanta plant. How it ended up in the Pacific Northwest I guess we’ll never know. 05D = assembled the 5th week of May. STYLE 60-4667 = 1960 Invicta Convertible. BODY FB 4363 = The 4363’rd Invicta Convertible to come from the Fisher Body plant in Flint, MI. 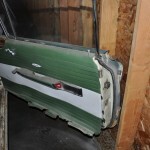 TRIM 600 = Green/White Invicta Convertible Vinyl. PAINT MM4 = Casino Cream with Green convertible top. 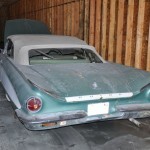 A of trivia: a light brown 1960 Invicta was the vehicle used to transport the heroin in the “real” French Connection, not the Lincoln used for the Gene Hackman film. Evidently, the smugglers were aware that this model had significant natural cavities under the fenders and undercarriage that could be used to escape notice in a cursory inspection. My sons 1960 Lesabre’s turn signals are not working due to the small plastic actuator that moves the switch cable being broken, The shop manual referes to this as a turn signal switch bellcrank but I have done many searches looking for this part and cannot find anything. Do you know whther it may be refered to by another name? The parts should be the same as for Chevrolet. Researching Chevrolet should find the info you need. 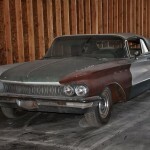 I am restoring a 1960 Buick Invicta 4-door. The car does not have an engine. If I still cant find an original engine, which other engine (Buick or other) will fit this car with minimum or no major alteration. Would be grateful for some technical advise. To Paa, you are going to want to find a nailhead engine and make sure it’s either a 59 or 60 engine. If the engine is from other years the bell hoisin will not match nor will the crank shaft ( I learned the hard way). 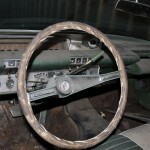 Visit nailheadbuick.com and speak with Russ Martin to get tech info. If you use a different engine entirely, you’ll have to change the rear completely and buy a torque tube eliminator kit and install a different transmission. Buicks from this era are very exclusive.